I'd rather be metal detecting. And when I'm not...I'm thinking about it. Like many, I caught this hobby disease years ago. Once you get it, you can't shake it. It's also a contagious disease. This disease spreads easily, infecting many who never imagined they would be caught in it's grips. Does this explanation also sound like you? 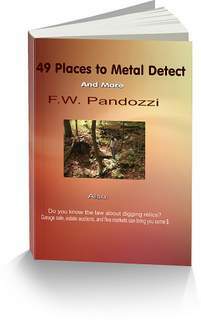 Do you love metal detecting? Are you thinking about starting this GREAT hobby? Are you a ghost town junkie? Would you like to search for those old towns? To be fair, the hobby is so much more than just searching for the old towns, as you'll learn throughout my website. But the ghost town searching is a great way to begin the hobby. Do you have questions about metal detectors? Do you want to find a local detecting partner to help you, or to just share a good time with? So grab a drink of your favorite beverage, and browse through the four hundred plus pages. Did you know that these old settlements exist in the east? 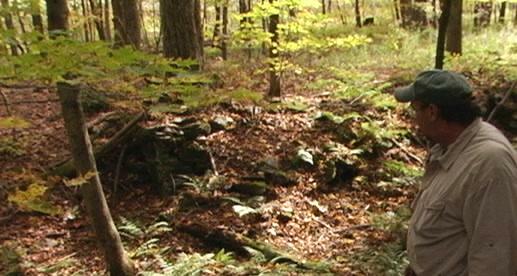 Why Metal Detecting Ghost Towns of the East? Here is my answer to those questions. My name is Frank Pandozzi. For more than 40 years I have located and detected around hundreds of these old towns in the east. I was the first one (ya, I’m tooting my own horn here) who filmed a TV series, a program for history lovers, and metal detectorists, regarding Eastern ghost towns. My TV series, “Ghost Towns of the East” and eight other different TV episodes, are being sold as downloads. I have also written a book about this subject. Now, I take that experience, and show you everything you need to know at my website. You’ll have all the tools to search for those lost settlements. If you are already involved with this exciting hobby, I’ll give you information that you may have missed elsewhere. My website has hundreds of pages with new and updated information. Everyday I update my website with new pages, or I am adding information to old pages. I have research and resources available to me that I pass on to you each week. The hobby is changing. The laws that affect the hobby are a big part of those changes. You need to understand them. My website provides you with that information. What else is changing is the new technology with metal detectors. Manufacturers are coming out with new products that out date previous models each year. It’s especially confusing to the newbie regarding what detector to buy. I help you decide. If you are not interested in the hobby, but you are looking for an exciting adventure to enjoy either by yourself, or with your family, then searching for the old, eastern ghost towns is a great pastime. Or perhaps you are a teacher, and you’re looking for another way to teach your students about early American history, my website, and TV series will do that. There’s no telling what kind of treasure you will find; And I can’t promise you that you will make the discovery of a lifetime. However, even if you don’t find a buried cache or lost relics from years gone by, I’ll show you that the treasure can be in the search itself. Metal detecting can become a way of life! Let the adventure…and the search begin here.